Bienvenidos a Argentina. the land of meat! If you like a good steak, this is the country for you. But don’t worry if you are vegetarian, Buenos Aires is leading the way in innovative cuisine (including the green kind) and the rest of the country is gradually following its lead. From slow grilled traditional asados to Japanese cuisine or even more recently molecular gastronomy, Argentina is breeding a greater variety of eating experiences. The ultimate eating experience here though remains the famous asado, a ritual gathering of people, a pile of hot, fiery coals and a large hunk of meat. 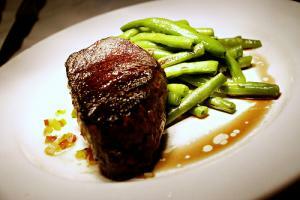 Argentinean beef is renowned across the globe and with good reason. Delighting on their homegrown cattle Argentines consume more beef per capita than any other country in the world. Meat is always the key player so don’t expect much in the way of salad or vegetables when at a family home or restaurant. Traditional restaurants still hold the title as the most popular cuisine in Argentina however with the country’s strong European heritage Italian food is quickly becoming a close second. Every town has at least one pizza place and the Argentines have some traditional heladarias (ice-cream shops) that could easily rival the original thing across the Atlantic. In larger towns and cities, you will see more than the usual gaucho grills and pizza as international cuisine is working its way to the forefront with an impressive range of dishes stretching from Asian cuisine to Northern American and plenty in-between. Peruvian restaurants are cropping up all over the country and you will not even be too hard pushed to find Sushi restaurants in most of the big cities. 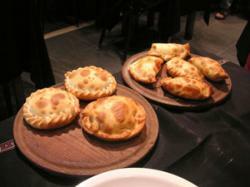 If however you want to stick to traditional Argentine foods during your time here you will certainly eat your fill of the nation’s tastiest natural resource, beef, although there is no doubt that empanadas will also play a big role in your culinary experiences. Small baked or fried pastry pockets stuffed with a variety of fillings from cheese and ham to meat and olives, you are sure to find a favourite in no time. For those with a sweet tooth, Argentina’s kitchen does not disappoint. 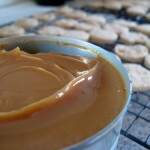 Dulce de leche (toffee-like thick condensed milk) is one of the nation’s greatest vices and appears on dessert menus, slathered on sweet treats in the bakery and even on breakfast tables. Don’t miss the alfajors (dulce de leche sandwiched between two sweet biscuits), which are abundant in every kiosk in every variety. Thanks to picture_bunny and lovlihood on flickr! This page rendered in 0.479 seconds.